August issue of What Hi-Fi? Sound and Vision on sale now! | What Hi-Fi? August issue of What Hi-Fi? Sound and Vision on sale now! The August issue of What Hi-Fi? Sound and Vision is now on sale, packed with the latest technology news and reviews to help you get the most out of your music and movies. And there's a new way to buy the magazine online, giving you the opportunity to buy single issues or subscribe, wherever you are in the world. 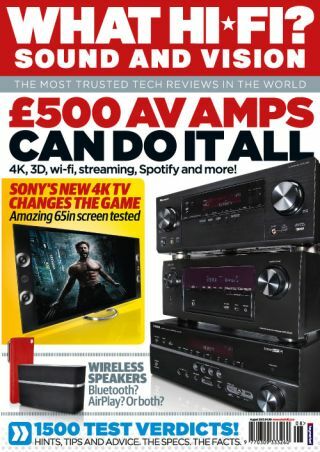 This month we've got a Supertest on 40-42in TVs, a hugely anticipated Group Test of 2013 AV receivers from all the big-hitters, plus a test of wireless AirPlay and Bluetooth speakers. And much more besides. Our First Tests section is once more packed with new products, including our in-depth look at the new Sony KD-65X9005A 4K TV. This month's Insider takes a look at the PS4 vs. Xbox One battle – and why it will affect you, even if you're not in to games. There's all that and more – including our new and improved Playlist section – in our August issue, on sale now in store, online and available to download from iTunes directly to your iPad, or for non-Apple users via Zinio.